PBD Worldwide is excited to announce the opening of their new Atlanta office. PBD’s Atlanta office will be home to Freight Scouts, PBD’s freight brokerage division and Swag Promo, PBD’s promotional division. PBD’s nationwide network now includes seven locations strategically located across the United States. Freight Scouts is the non-asset transportation brokerage division of PBD Worldwide. 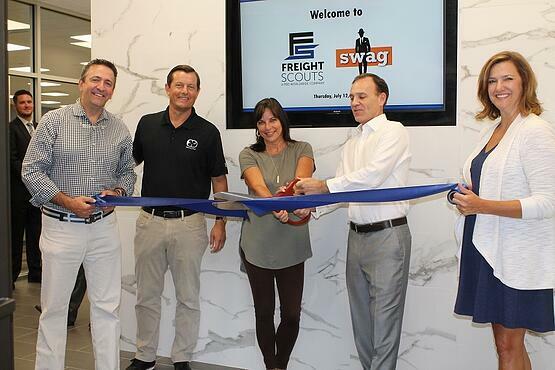 Freight Scouts focuses on delivering exceptional freight solutions to clients for Truckload, Less-than-Truckload and Parcel shipping. These services complement the warehousing and fulfillment services offered by PBD Worldwide, but also stand alone to provide shippers with unmatched value and cost-savings for their overall transportation spend. To learn more, visit www.freightscouts.com. PBD’s promotional products division, Swag Promo, was born from our clients' need for the highest level of service in logistics and procurement, combined with creative services to take their products from just logo items to an extension of their brand message. Swag Promo has over 25 years of experience assisting companies with complex promotional needs including garment sourcing, custom imprint, points based rewards programs and traditional event-based promotional items. They offer an unlimited selection of quality products and industry-leading logistics and fulfillment capabilities. To learn more about Swag Promo's services, visit www.orderswag.com. PBD Worldwide was founded in 1976 by James E. Dockter in Columbus, Ohio, with the goal to provide the best possible storage, distribution and fulfillment services. After relocating headquarters to Atlanta, Georgia, in the late 1980's, PBD has expanded to become a national provider of superior fulfillment and freight services, contact center services, technology and print and mail solutions. Today, PBD Worldwide is still a privately held company and now in its second generation of ownership. PBD employs up to 350 people, operates out of seven domestic locations and one international location equaling 536,000 square feet.